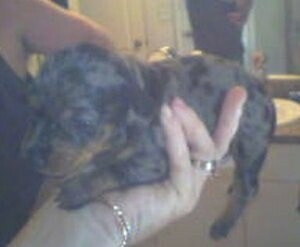 "This is my Doxie-Pin named Rowdy Rooney. Rooney is about 9 months old. He lives up to his name. He's very rowdy. He loves to give kisses. 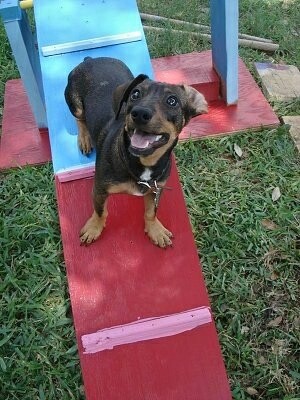 He is also starting to do agility. I'd say he's the sweetest dog I've ever had. He's very affectionate. Rooney likes to dig for grubs and eat them. 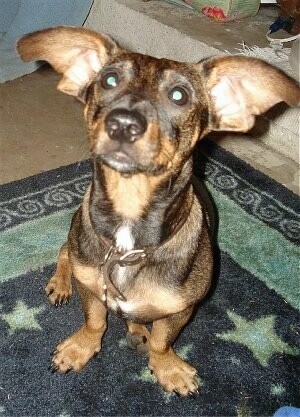 Sometimes his ears flop down like a Dachshund and other times they are more pricked up. I think it's the Min Pin in him." 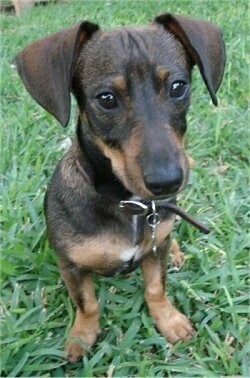 The Doxie-Pin is not a purebred dog. 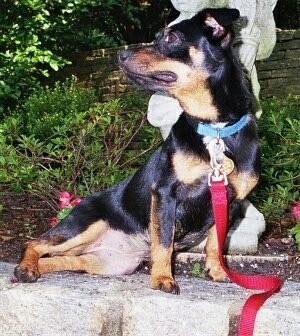 It is a cross between the Dachshund and the Min Pin. The best way to determine the temperament of a mixed breed is to look up all breeds in the cross and know you can get any combination of any of the characteristics found in either breed. Not all of these designer hybrid dogs being bred are 50% purebred to 50% purebred. It is very common for breeders to breed multi-generation crosses. 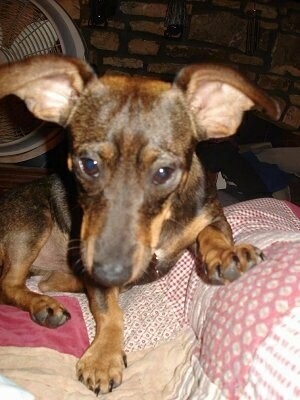 Zoe the 2-year-old Dachshund / Min Pin mix (Doxie-Pin) I adopted from animal rescue in Augusta, GA.